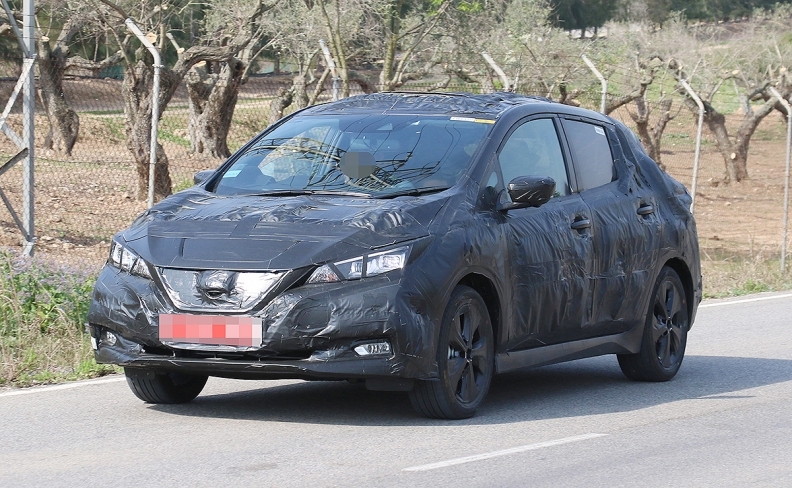 The next-gen Nissan Leaf, shown during testing in this spy photo, gets Nissan's signature V-motion grille, a drastic pivot from the face of the first generation. Canadian sales of the Nissan Leaf have grown every year since the electric vehicle’s debut in 2012 and now the next-generation Leaf has been spotted testing, and spy photos indicate that the electric vehicle’s styling will line up with the rest of the brand. In 2016, Nissan sold 1,375 units in Canada, up 11.5 per cent from 2015 and setting a new annual sales record for the vehicle. Quebec, Ontario and B.C. led the country in sales, due in large part because the three provinces offer government incentives on electric vehicles. Despite heavy camouflage, it’s clear that Nissan is giving the next Leaf its signature V-motion grille, a drastic pivot from the face of the first-generation EV. It also appears the vehicle’s taillights have been given lower placement. The taillights also have a more traditional look compared with the first generation’s flowing vertical design. Some styling cues of the test mule are similar to those of the first generation, including the side profile and hatch. On the technical side, the critical change will be improving the driving range of the Leaf’s lithium ion battery, which currently claims an EPA-rated equivalent of 114 mpg combined city and highway on a full battery charge. The car is also expected to be lighter because of increased use of carbon fibre. Nissan has signalled that the redesigned Leaf will have a range of close to 200 miles. Some reports have the next Leaf going on sale next year after a public unveiling this year.